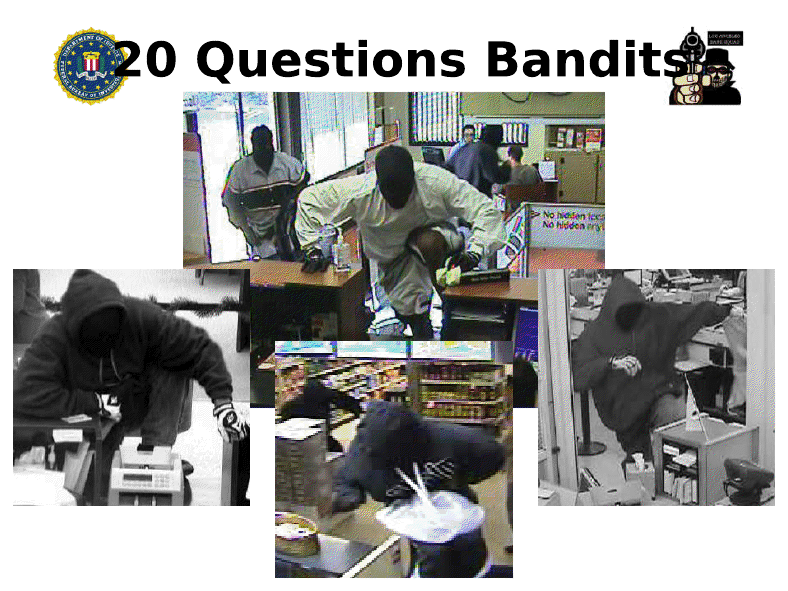 FBI Agents and detectives with multiple law enforcement agencies in three counties are seeking the public’s assistance in learning the identity of the “20 Questions Bandits,” a group of at least four unidentified men believed to be responsible for eleven takeover bank robberies in Ventura, Orange and Los Angeles Counties. U.S. Bank, East West Bank, Cathay Bank and several Bank of America locations were targeted by the bandits. Bank of America is offering a reward of up to $100,000* in exchange for information leading to the arrest and conviction of the individuals responsible for these robberies. During the various robberies, the bandits were extremely violent and, in some cases, displayed weapons. Witnesses have described four black males, in some cases armed with guns, who have forced bank employees and customers inside the bank to comply with their demands for cash and to follow their instructions. 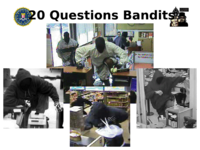 The most recent robbery attributed to the “20 Questions Bandits” occurred on April 2, 2010 at a Bank of America in the city of Newport Beach. The group is also believed responsible for robberies in El Monte and Rowland Heights, Eimiller said. This entry was posted in FBI and tagged 211, El Monte, FBI, Rowland Heights by Frank Girardot. Bookmark the permalink. The reward is a poor attempt by BOA to look like they care (PR), the ’20 Second Bandits’ are a knock-off of the Rollin 30’s, Rollin 60’s, “Grape Street Crips” etc etc and then throw in the Blood Boys that hook-up with the Crips. They have been in business since 1992 when I started the bank robbery website www-scorpio-security.com and http://www.bank211s-mike.blogspot.com and they have ALL been in-custody overnight after making MILLION $ bail then robbing next morning. The reason they keep ‘Rollin’ is because the “Banking Cabal” refuses to take preventive measures to protect customer and employees, now they give away DONUTS and Coffee. Pull up websites and see for yourself. The worst thing is the last victim of these Terrorist Bank Robbers is pleading for advise from from banking cartels that wouldn’t pour water on a burning customer in the lobby. Breaking Press Release…. FBI and police broke up major conspiracy to kidnap bank executives and rob several banks in area. 3 ghetto Rats from L.A. in-custody. Hope they can find the bandits soon. I wish there’s no crimes in any countries. There’re too many bad guys and crimes. Why don’t they live peacefully? I had a dream to begin my organization, but I didn’t have got enough amount of money to do this. Thank heaven my close fellow proposed to take the business loans. Therefore I took the commercial loan and realized my dream.